From a Glassmen press release: Toledo, Ohio-based sportscaster Joe Rychnovsky, from WTOL Channel 11, visited the Glassmen during spring training to see "what we were all about." The drum line, rehearsing on the field at the G-West Rehearsal Facility, decided to ask Joe to "Try This!" for his weekly segment on the evening news. Percussion caption head Chris Hestin shows Joe Rychnovsky "the ropes" as members of the Glassmen drum line look on. When asked which drum he would like to try, Joe requested the "30 pounder" (he ended up on a snare drum). Percussion caption head Chris Hestin "showed him the ropes," and before he knew it, Joe was off and marching with the drum line block. It was all fun and games for a while, but when he realized the block wasn't stopping anytime soon, he finally jumped from the line yelling, "I quit! I quit," admitting it was a little harder than it looked. 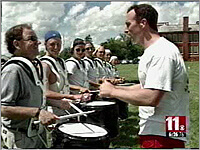 The segment aired on the evening news broadcast, and aside from a few media misnomers in the piece, the drum line had a great time hanging out with Joe. Hopefully he'll recover soon, as WTOL Channel 11 will return to the UT Glass Bowl on Saturday, June 19 to cover All-Star Review competition in Toledo. View the video segment.